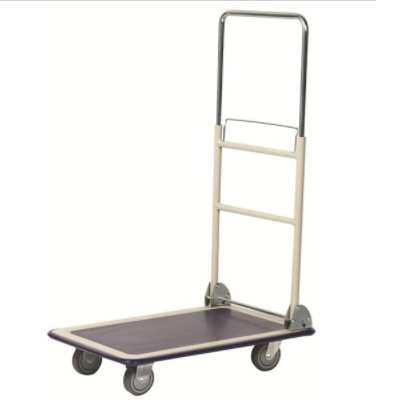 This high quality telescoping handle platform truck from Wesco has a cargo capacity of 660 lbs. 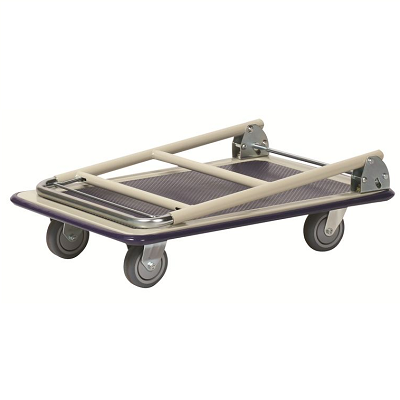 It comes equipped with 5-inch non-marking casters for easy movement and steering, vinyl deck mat to protect loads, a rubber hand grip for comfort and a perimeter bumper to protect walls and furniture. With the push of a lever, the handle slides up or down to the most comfortable operating position. The telescoping handle locks at 4 operating heights (32", 37", 41" and 44"), also acting as a support for taller loads. 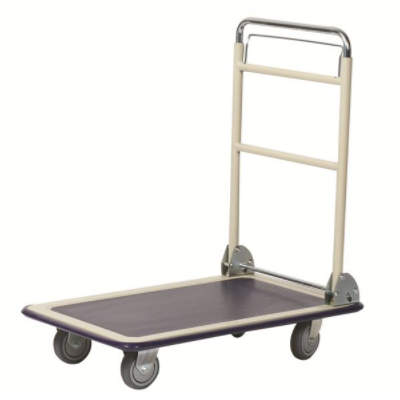 The handle folds down for easy storage and transport. Stepping on the release bar allows the handle to be folded down and pulling the handle up locks it in position for use. Handle Top Height: 32" to 44"
Overall Height: 32" to 44"
We are extremely happy with our purchase and like the quality of the product!! They got it to us in a reasonable time. Advantages: Prompt service and professional customer service. Disadvantages: I would like a longer length but realize it was not available in such! !